Jim Corbett National Park is an ideal home for many majestic animals like the Royal Bengal Tiger, Asiatic Elephant, Reptiles, Birds and many other wild animals. Corbett Tiger Reserve has captured the imagination of many with its diverse wildlife and breathtaking landscapes. The natural uniqueness of the area was recognized long ago as a result of which in 1936 Corbett attained the distinction of becoming the first National Park to be established in mainland Asia. The park was then named as the 'Hailey National Park' and was later renamed as 'Jim Corbett National Park' after James Edward Corbett the noted hunter turned conservationist of the area. The area came under 'Project Tiger' in 1971 when Gov. of India launched this ambitious conservation project. Today after addition of areas into the originally declared National Park, the total area of Tiger Reserve extends 1288.31 sq. kms spreading over three districts of Uttarakhand viz., Pauri, Nainital and Almora. 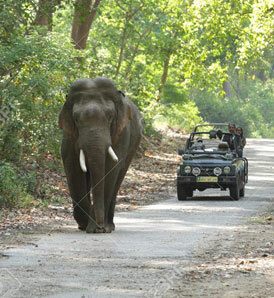 Jim Corbett National Park covers an area of 521 sq. km and together with the neighboring Sonanadi Wildlife Sanctuary and Reserve Forest areas, forms the Corbett Tiger Reserve. Geographically it is located between the Shiwalik Himalayas and the terai. The streams, rivers and ridges crisscrossing the terrain, present Corbett with a remarkable variety of landscapes. This vivid mosaic of habitats wet and dry, plain and mountainous, gentle and rugged, forests and grasslands supports numerous plant and animal species, representing Himalayan as well as plains ecosystem. 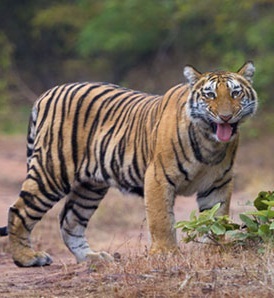 The most famous of Corbett's wild residents are the Royal Bengal Tiger and the Asiatic Elephant. In addition to that with over 550 species of avifauna Corbett is one of the richest bird regions of the Country and has been declared as an 'Important Bird Area' (IBA) by Birdlife International. Bijrani FRH offers you night stay amidst the large forest in their beautifully built rest houses. Bijrani Forest - There is a Government forest rest house inside this zone that permits night stay in the lap of nature. Along with these 32 rooms, Forest Lodge at Dhikala also possesses two dormitories which consist of 12 bunk beds and a common bathroom in each dormitory. However, all the 32 rooms have their own attached bathrooms with..